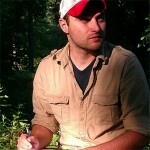 This is a guest post by our PhD student Larry Long. 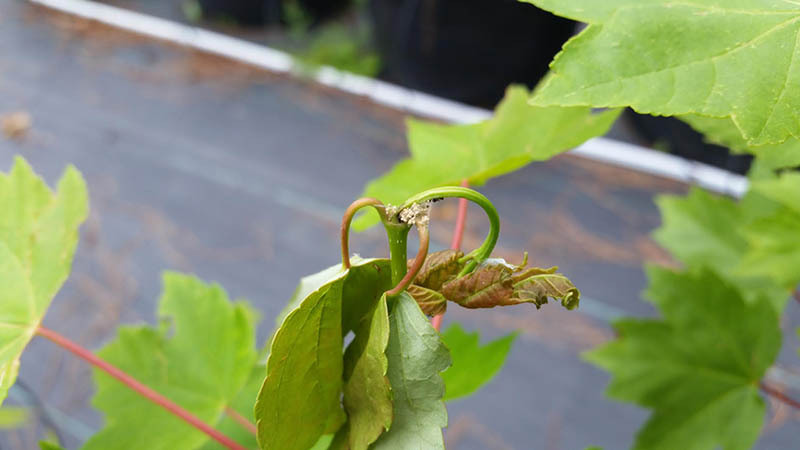 Maple shoot borers (Proteoteras aesculana) are common pests of red maples in nurseries. This caterpillar causes flagging and dieback of the apical shoots of maples (Acer spp.). It is too late this season to manage this pest or damage with insecticides but recognizing the damage could inform your management next spring. Maple shoot borer adults are small nondescript moths that lay eggs on maple stems near expanding buds in early spring. After hatching the caterpillar burrows into the growing shoot where it feeds on the vascular cambium. As the larvae develops it expels frass and silk from the hole through which it entered the stem. Young stems and leaves above the point where the larvae entered eventually die. Mature larvae exit the shoot then pupating on the ground. There is no evidence of summer season egg laying so it is thought that upon emergence from their pupae the new moths seek overwintering sites. Monitoring for damage by this pest is not very useful because by the time damage occurs management is impractical. However, if a high proportion of plants are infested this year it could warrant preventive insecticide applications next spring. To confirm that damage is from maple shoot borers and not another pest like potato leafhoppers, cut open flagging stems to see if they are hollow and if larvae are present. The larvae are a tan to cream-colored with a dark head capsule. Preventive management entails applying pyrethroid insecticide from just before bud break until shoots have flushed their first two pairs of lateral leaves. 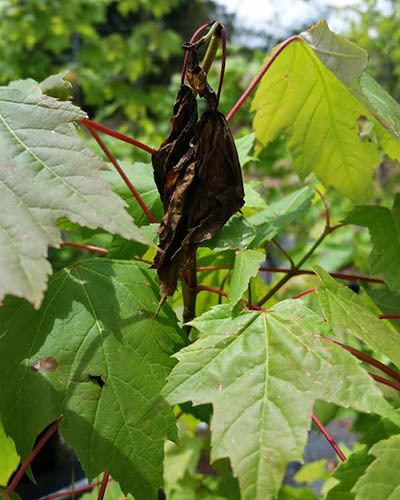 Since this is in early spring you may be making these applications anyway for ambrosia beetle management so there is no need to spray extra just for maple shoot borer. Preventive applications are important because once symptoms appear it is too late for treatment. Damaged shoots should be pruned and a new leader trained to correct tree form. See our guides for IPM of of trees and shrubs in nurseries on our extension resources page. I research how feral forest fragments mitigate the effects of urbanization on trees and their pests.